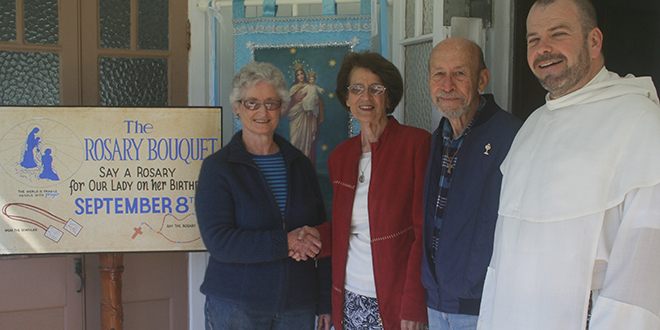 Prayer warriors: Former co-ordinator Regina O’Shaunessey hands the Universary Rosary Bouquet into the hands of Gail and Kevin Shorthouse outside their new office at Marian Valley, with Pauline Father Columba Macbeth-Green. HANDMADE Rosary beads made by the Universal Rosary Bouquet will soon be distributed to third world countries and primary schools in Queensland thanks to a new merger with Catholic Mission. Brisbane’s Universal Rosary Bouquet co-ordinator Gail Shorthouse recently met with Catholic Mission Brisbane’s director David McGovern to discuss sending Rosary beads to Mongolia, the focus of Catholic Mission’s World Mission appeal for this year. Mrs Shorthouse said the Universal Rosary Bouquet would also donate 1000 Rosary beads to Catholic Mission to give to schools, National Evangelisation Teams Ministries and at next year’s Ignite Conference for youth in Brisbane. There are five volunteers who create the handmade Rosary beads and an extra two also make scapulars. But more volunteers are needed to ensure more people can learn to pray the Rosary. “We have 8000 Rosary beads put together, but when I took over in July, there was already 100,000 Rosary beads already sent overseas,” Mrs Shorthouse said. Since 1977, the Universal Rosary Bouquet has distributed millions of beads throughout the world and Australia. In 1974, police informed Brisbane couple Margaret and Bern Foley that their daughter, Margaret Mary, had been involved in a serious car accident and was in hospital. Doctors gave Margaret Mary one night to live. The couple asked friends and family to join them in praying the Rosary for Our Lady’s intercession. Margaret Mary remained in a coma for the next two-and-a-half years, dying peacefully on August 16, 1977. Though they had lost their daughter, the Foleys had not lost faith. In the years after Margaret Mary’s death, more than 60 countries and “millions of Rosaries” were prayed on September 8 for world peace. The Pauline Fathers at Marian Valley, Canungra, are the custodians of the Uni-versal Rosary Bouquet. Mrs Shorthouse said anybody interested in volunteering to make Rosary beads or scapulars can contact her on 0429 026 965.